My 11-year old daughter creates amazing artwork on her I-pad. This one she made on an app called "Drawcast" which also creates a video of the lines and fillers you used in the process so you can watch what you did after the fact. Every line, shape, circle. It's a little replay that I haven't figured out how to share here yet, but you can view it if you have the app and search by the title. I love the explosion of art and technology. My daughter and her friends make videos, design new fashions, invent new hairstyles. It's a creative child's heaven to have access to so many ways of expressing yourself. Glow Doodle-Draw a picture and press the glow button to see what happens! Doodle Buddy-Draw and use stamps and stickers. Upload a photo from your library and draw on it. Falling Stars-You draw a picture and then activate the stars that bounce against your drawing and make music. Different sounds depending on what tools you used. I love the explosion of art and technology too, though I'm struggling a little bit with the idea that work produce through technology can really be 'art'. That's my hang-up, and I know it. Have you tried Scribbler? It's great fun!! I love it. I found it by accident a long time ago, but still keep going back to play with it. In case your blog doesn't allow weblinks, it's 'doubleyou doubleyou doubleyou dot zefrank dot com' and you simply add a forward slash and the word 'scribbler' at the end of the URL. Thanks for the tip Jay. I will check that out. My daughter is the real digital creator. She's much more comfortable in that medium than I am. I think I like the feel of the actual products in my hands as part of the experience. I have seem some pretty amazing creations on Draw Cast though, and you can watch the artists process of putting down the marks. 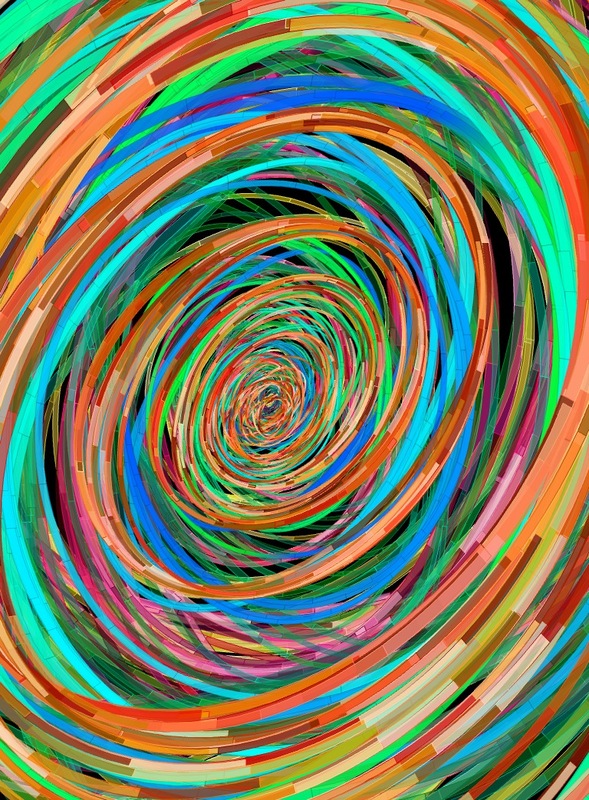 he swirly design that she made I use as my screen saver at work and get a lot of comments on it.